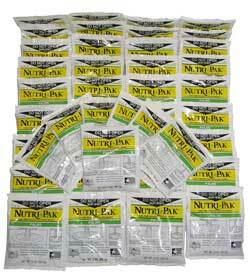 For Palm Trees we recommend our N-P-K formulation of 12-4-12 with full set of micro- nutrients. This formulation is ideal for all palm trees. It was developed in conjunction with palm nutrition experts in Florida, and is designed to give your palms good overall greening, growth and health. We have added micronutrients, such as 4% Magnesium, 4% Manganese, 2% Iron and .5% Zinc, to the N-P-K formulation to combat problems commonly known as Chlorosis, a yellowing of the palm frond, and Frizzle Top, where the fronds separate on the ends making them look like frizzy hair. For Palm Trees: Bury unopened packets 6-8 inches deep – spaced evenly in circle(s) surrounding the tree at distances of 2, 4 and 6 feet from the trunk. For small palm trees use 3 packets at the first circle. For medium palm trees add 6 more packets at the 2nd circle. For large palm trees add 9 more packets at the 3rd circle.